Jaysh al-Islam militants leaving Douma under the framework of an evacuation agreement were forced to give up their weapons, including Israeli-made sniper rifles and Belgian-made rockets and machineguns, a security source has told Sputnik Arabic. 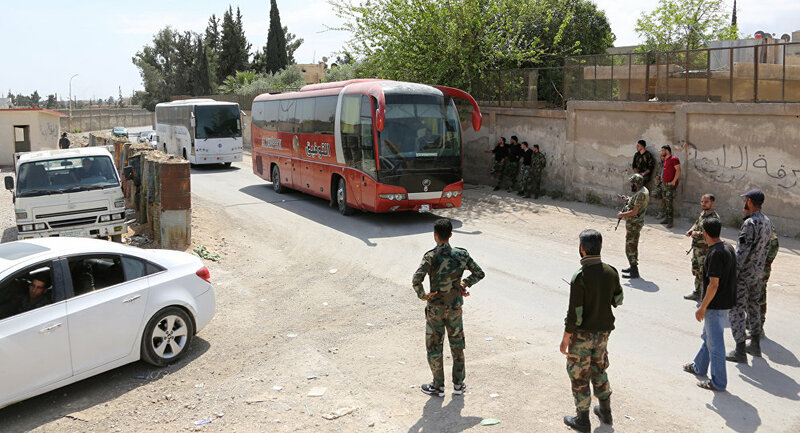 3,792 people, including 1,384 militants and members of their families, are being evacuated from Douma and taken to the town of Jarabulus in northeastern Aleppo, northern Syria on 85 buses, with the withdrawal expected to stretch out over two days. Militants have also agreed to give up their heavy weapons by Thursday. Late last month, Douma residents took to the streets urging militants to join the ceasefire. 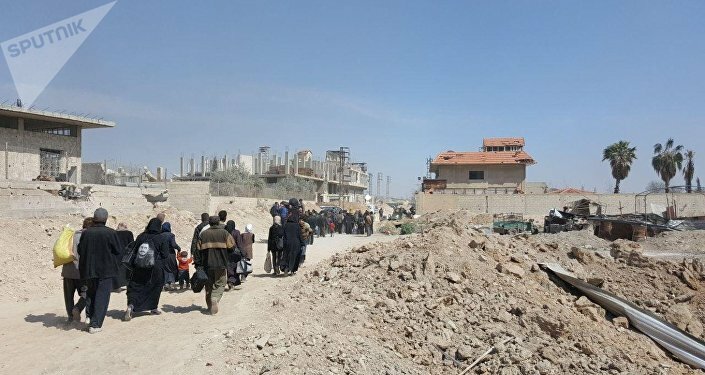 This week, civilians took over several warehouses previously used by militants to hoard food, fuel, and other supplies as a means of controlling the population. Russian military police forces have entered the town to help ensure law and order as reconstruction begins. The Russian Center for Syrian Reconciliation confirmed Thursday that the Syrian operation launched in mid-February to free Eastern Ghouta from a collection of Islamist groups has officially wrapped up. "Today, a landmark event in the history of the Syrian Arab Republic took place. The state flag flown over a building…in the city of Douma marked the regained control over this settlement, and consequently over the entirety of Eastern Ghouta," Maj. Gen. Yuri Yevtushenko, head of Russia's center for Syrian reconciliation, told reporters. The Syrian Army launched Operation Damascus Steel on February 18 to clear the militant-held Eastern Ghouta pocket following years of militant shelling into the Syrian capital. Prior to its liberation, the region had been held by Jaysh al-Islam, the Al-Rahman Legion, Ahrar al-Sham, and the al-Nusra Front*, al-Qaeda's Syrian affiliate. In the course of Operation Damascus Steel, the Syrian military has been finding large stocks of small arms, artillery shells, anti-tank missiles, and other supplies made in Israel, the US, and other NATO countries.